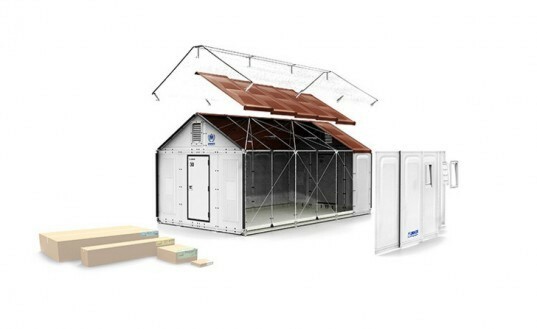 IKEA just turned its flat pack sensibilities from the urban apartment to the global village by unveiling a comfortable, solar-powered shelter that can provide emergency housing for natural disaster victims and refugees. The flat pack homes were developed in collaboration between the IKEA Foundation and the United Nations High Commissioner for Refugees (UNCHR), and they can be set up in a snap to provide immediate shelter for those in need. Prior to the IKEA collaboration, the UNCHR was only able to provide tents or converted mass-shelters for the influx of refugees into countries around the world. Now, with IKEA’s help, these displaced citizens will not only have privacy and comfort, but the dignity of having their own place. IKEA’s shelters come flat packed, making for the easy transport of lightweight plastic shelters at once. Assembly of the 188 square foot hut is easy and can be built in just four hours. Five people can sleep comfortably inside, which is twice the size of the regulation refugee tent. The best part, the homes have solar paneled roofing, allowing inhabitants to generate their own electricity, extinguishing the need for candles or kerosene lamps. The roof also helps to deflect solar reflection by 70%, keeping the interior cool during the day and warmer at night. The new IKEA/UNHCR shelters will make their first be deployed in Ethiopia next month. Would love to have one, and when the flood hit here in June this year we could have used about 200 of them here in my are we had that many that lost everything. I think the flat box housing is brilliant, especially for refugees and others requiring emergency shelters. Please let me know if I could purchase one in US. Moving to undeveloped land and would make first year more bearable. The next step is a toilet. I hear the Bill Gates Foundation is working on one that doesn't need plumbing. Imagine if all sales to the general public could provide housing for the homeless everywhere, not only refugees. What percentage of the profit would this cost? I would very much like to purchase one of these. Please let me know when or if ever they will be available to the public. They cost $1000 each. There are options for winter insulation and they come with solar power, one light and a USB port. Floor area 17,5m2 Ventilation openings 2 pieces (800cm2 each) Sphere compliant Yes Expected lifespan* 3 years Wind speed (frame) 18 m/s (EC1) Modular Yes Package Weight 140 kg Package A 1960x1100x240mm (70kg) Pallet dimensions 1960x1100x140mm Container 40 feet HC 48 RHU shelters Windows 4 pieces (620cm2 each) Door 1 piece (740x1690mm) Minimum ceiling height 1840mm UV 2700 UVA – 100% functionality Snow loads 10 kg/m2 (EC1) PV system 4h light/day and USB power Package Volume 1.04 m3 Package B 1960x1100x240mm (70kg) Container 40 feet 36 RHU shelters Sounds like for now these are only available in bulk to relief agencies, thus the 40 ft Container with 36 of them listed above. I hope they make them available for sale to the general public, or that one of the folks here that have expressed a commercial interest hears from them. The Lada Cube alternative is also worth looking into, but I could not find any cost info on their site. What is the cost of these, would they be reasonable for housing the homeless? should be available to the pub;ic as well. How much does a unit cost? I would think that will ultimately be what determines how many will be deployed. How much does one cost?? Where can you buy them?? Where can a future homeless person get one of these?? I'm pretty sure that I will be homeless soon, due to disability and unemployment. I want one How can I buy one of these. Execlllent!, Hurry to deliver thousands of those shelters to Filipinas, now!. Tnhanks. Seems like a temporary solution that will just create more garbage around the world. There already exists a tent like solution that when you soak becomes like concrete when dried. They would be much better panels. More stable and safer for inhabitants. This is a fail of design. More in the way design for failure and need for replacement crap thought process. Sorry i don\\\'t buy into this theory. We have been building refugee shelters since 1965, and there are shelters we erected in 1967 for Palestinian refugees for UNWRA which are still in use outside Amman, Jordan. See www.conport.com Our Conport 21 system was developed to withstand winds of 120 mph and sandstorms of the kind you get in the Middle East. It is evident to us that the IKEA system will not withstand these conditions. (For example the We have other systems we have developed over the years using our experience gained from working in over 40 countries, often with UNHCR. The obvious material to use for cladding is steel, as it is economical, strong, long lasting and has good fire performance compared with plastic. Using steel eliminates the need for a frame. For insulation fibreglass is the most economical, not least because it compresses to 1/5th of its volume for transport and does not give off noxious fumes in a fire. We have nearly 50 years experience in this field and it is depressing to see the wheel being reinvented, particularly in such an obviously impractical way! We would be happy to work with IKEA, (or anyone else), in order to come up with a practical solution. IKEA did what the US government could not do even with government spending in the billion$. A price of 1000$ each would make a game changer in housing. Next, city, county and state regulators must drop their ridiculous rules that prevent erecting viable structures for those that need them. Nothing wrong with inspectors looking after safety and health issues but government has gotten out of hand on regulation. Do you do donations for homeless organizations? Homelessness is also a disaster and health care issue. I see someone below has also expressed interest in these for the homeless/houseless. These really are wonderful and needed. Please contact me if these can be donated to those in need. I belong to a homeless activist/advocate group and they would be the recipients, not me. Thanks. I am in the process of hand-building a home in the forests of Montana ... rather than living in a tipi, this little survival unit would be perfect ... plus it would have numerous other uses around the place. How much for one? Where/when can I get one? CAN I get one? I could see IKEA marketing these to the non-huddled masses for back-yard sheds, temporary cabins in the summer, etc. And, with the proceeds, help fund more shelters for the needy. It would be a win win! What a brilliant concept and why don't they use it here for the homeless? Superb and a workable concept. It is about time large corporations took their social responsibilities seriously. With world problems of shelter for those who have been forced to move, loose their dignity and privacy because of a mindless few can now be addressed better. Maybe we can now say that in this new century we actually have moved a little closer to social autonomous integration without borders where a fellow human's life comes first before monetary values. what if it gets cold. its looks great and yes i would like one but looks like it would only work in warm wether. and with all te plastic is it safe to cook in there if it was needed ? "The roof also helps to deflect solar reflection by 70%, keeping the interior cool during the day and warmer at night." How does deflecting solar radiation keep it warmer at night? Brilliantly simple idea, well done designers! We’ve all seen IKEA’s innate ability to transform any area into a cozy, homey space (just look at how comfortable their store displays are), and taking on disaster and refugee relief is a no brainer for the company. Until the IKEA collaboration, the UNCHR was only able to provide tents or converted mass-shelters for the influx of refugees into countries around the world. Now, with IKEA’s help, these displaced citizens will not only have privacy and comfort, but the dignity of having their own place- that can last for three years. The makers of the furnishings in your first “grown up” apartment, IKEA, have turned their easy assembling sensibilities out of the urban apartment and onto the global village. The Swedish design retailers have created a comfortable and livable solar powered shelter to help both natural disaster victims and refugees alike. 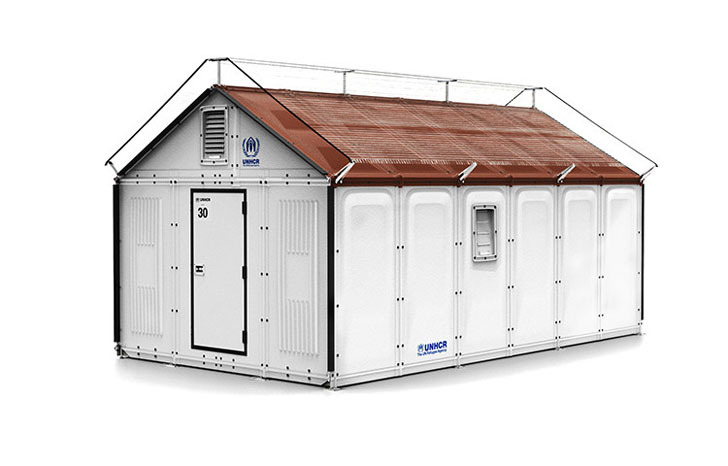 A collaboration between IKEA Foundation and the United Nations High Commissioner for Refugees (UNCHR), the homey huts will replace rustic tents for refugees in war torn countries. We’ve all seen IKEA’s innate ability to transform any area into a cozy, homey space (just look at how comfortable their store displays are), and taking on disaster and refugee relief is a no brainer for the company. Until the IKEA collaboration, the UNCHR was only able to provide tents or converted mass-shelters for the influx of refugees into countries around the world. Now, with IKEA’s help, these displaced citizens will not only have privacy and comfort, but the dignity of having their own place. IKEA’s shelters come flat packed, making for the easy transport of lightweight plastic shelters at once. Assembly of the 188 square foot hut is easy and can be built in just four hours. Five people can sleep comfortably inside, which is twice the size of the regulation refugee tent. The best part, the homes have solar paneled roofing, allowing victims to generate their own electricity, extinguishing the need for candles or kerosene lamps. The roof also helps to deflect solar reflection by 70%, keeping the interior cool during the day and warmer at night. The new IKEA/UNHCR shelters will make their first appearance in Ethiopia next month, where locals will give the solar powered huts a test drive.